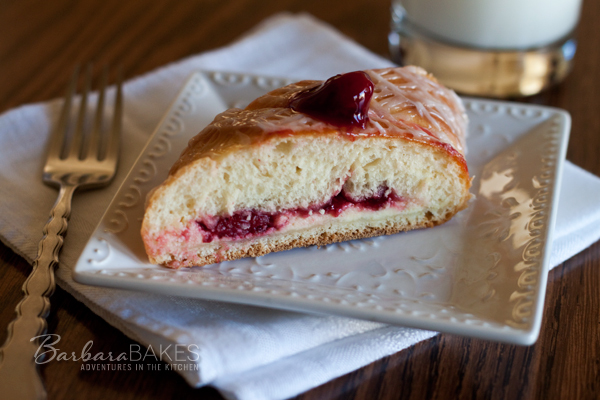 A sweet bread dough filled with cream cheese and cherries, “braided” and baked until it’s golden brown, then finished with sweet icing drizzled prettily over the bread. Today’s post is another wonderful recipe from the Red Star Yeast website. It’s the second in a series of three posts that I’ve team up with Red Star to bake one of their recipes. I knew I’d love the recipe even before I made it. I’ve made mock braids in the past and they’re easy to make, and fun to serve because they look impressive and always receive oohs and ahhs. The dough isn’t really braided. Strips of dough are cut on the sides of the dough and crossed over each other so it looks braided. 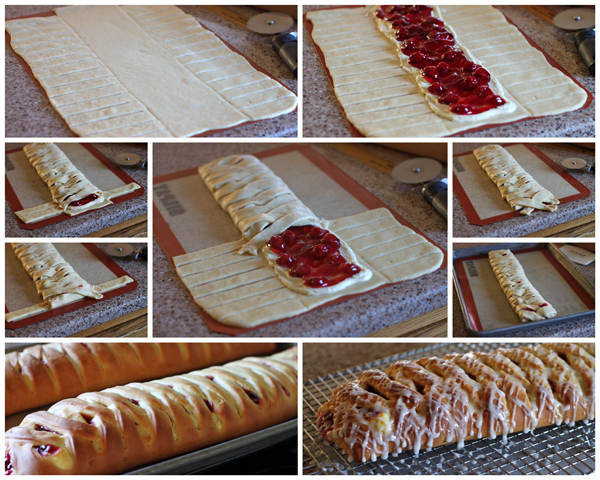 I like to create a flap of dough on each end by cutting away the strips of dough on the first and last rows. Fold the flap of dough over the filling and then start braiding so the filling doesn’t leak out when it’s baked. Criss-cross the pieces of dough until you get to the last rows. Fold the bottom flap over the filling, cross the last rows and neatly tuck them underneath the bread. I made this for breakfast for my daughter’s birthday. I didn’t want to get up super early, so I used the postpone baking tips on the Red Star website. After kneading the dough, I put it in the refrigerator overnight for the first rise. In the morning, I let the dough warm up a bit and then shaped it and let it rise according to the directions. A nice time saver in the morning. You could fill your beautiful coffeecake with a variety of fruit fillings. I used canned pie filling, but homemade would be even better. In mixing bowl, combine yeast, 1 cup flour, salt and sugar. Heat water, sour cream and butter to 120º to 130º F; add to dry ingredients. With mixer, beat 2 to 3 minutes on medium speed. Add eggs and vanilla; beat 1 minute. Gradually add remaining flour by hand or with a mixer that has dough hook(s); knead for 5 to 7 minutes until smooth and elastic. Place dough in lightly oiled bowl and turn to grease top. Cover; let rise until dough tests ripe, approximately 30 to 40 minutes. Punch down dough and divide in half. On a lightly floured surface, roll each half to a 12 x 17-inch rectangle. Spread half of filling lengthwise over center third of dough. Top with approximately half of pie filling. (Save a few cherries from filling to decorate coffeecake after it is baked.) On each long side, cut 1-inch wide strips, 2 inches long. Starting at one end, fold strips at an angle across filling, alternately from side to side. Place coffeecake on greased baking sheet. Cover; let rise until indentation remains after lightly touching the side of the coffeecake, approximately 30 minutes. Preheat oven to 350º. Bake in preheated over 30 to 35 minutes. Cool on wire rack. 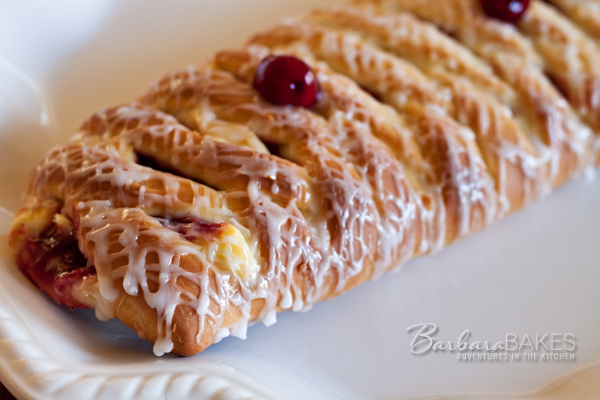 Drizzle with icing; place a few cherries on small lattice openings to decorate coffeecake. *You can substitute Instant (fast-rising) yeast in place of Active Dry Yeast.